Targeting older consumers, Samsung has developed the Jitterbug cell phone for seniors, a simple mobile phone with larger buttons, easy-to-read text, a comfortable shape and better sound quality. The latest in the series are the Jitterbug Plus and the Jitterbug Touch 2 smartphone. The Snapfon cell phone for seniors ranks up there with the best big button mobile phones designed for simplicity and ease of use. Most elderly people will find that the Snapfon ez phone lives up to its name. The latest in the ez series is the Snapfon ezTWO mobile phone. The Just5 cell phone for seniors and kids is one of a handful of phones now bucking the conventional trend for the latest and greatest mobiles. Fitting into a growing category of cell phones in which less is better, the Just5 J509 is as handy as it is simple. The newest Just5 phone is the J510 model. Modeled after the European EmporiaLife mobile phone for seniors, the ClarityLife C900 is said to be twice as loud as a regular cell phone, making it ideal for seniors needing the extra sound volume, even when wearing a hearing aid. A newer Clarity mobile phone is the Clarity Pal cell phone for seniors. Regular cell phones are just fine for younger seniors. However, in general, larger keypads and display screens are more desireable on cell phones for seniors. Select phones offer these ergonomic features. For example, some handsets offer zoom options that enlarge the display screen characters for better visibility. For the more elderly seniors, a "panic" button that automatically dials designated numbers for help is especially useful. So is a keyless dialpad. Now on several cell phone models, the GPS (global positioning system) location tracking feature is especially useful and applicable to cell phones for seniors. Cost is always a concern, especially for retired seniors with no disposable income. It is wise to consider prepaid cell phone plans as part of your review of specially designed cell phone plans for seniors. Also note that throughout the U.S., many state agencies and local community charities have programs that offer refurbished or recycled cell phones for seniors. For Seniors Outside The U.S.
Efforts to design phones for the elderly and aging continue especially in Asia and Europe. The solutions range from full-blown cell phones to emergency mobile phones. Regular cell phones are just fine for younger seniors. However, in general, larger keypads and display screens are more desireable on cell phones for seniors. Select phones offer these ergonomic features. For example, in "Simple Mode," many Vodafone handsets offer zoom options that enlarge the display screen characters for better visibility. Voice command features, available on most cell phones, can also be adapted for special needs of older consumers. Cell phones for seniors and children generally have a good bit in common, especially in features related to large keypads, large screens and large fonts. Case in point - the LG VX1000, also known as the LG Migo, has features that would work well for both mobile phone beginners and the elderly. The LG Migo - unlike the Wherifone - lacks a GPS feature. The one-button keypad is a primary feature of several regular phones with panic buttons such as the Telemergency ClearVoice 100 Emergency Telephone with Wireless Pendant. Variations of this useful feature have been cleverly adopted by mobile phones for seniors, including ClarityLife C900, Snapfon ez ONE, Just5 J509 and LG Migo. When combined with GPS capability, the panic button feature allows one to pinpoint the exact location of the cell phone with a few Internet keystrokes or simply by placing a phone call. Some mobile phones for seniors also provide the ability to speak with a live personal assistant anytime, anywhere with the press of just one button. Now on several cell phone models, the GPS (global positioning system) location tracking feature offers tremendous present and future benefits, especially in cell phones for seniors. This GPS feature makes the Wherifone GPS Locator Phone a standout among mobile phones for seniors. Cell Phones For Seniors Outside The U.S. 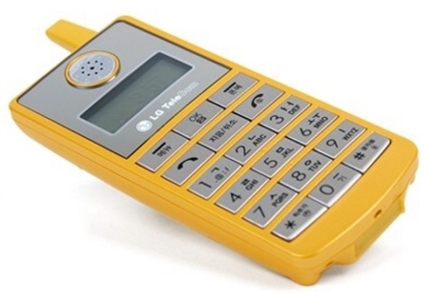 In Taiwan, Guidetek Technology of China's i-Care S-series mobile phone designed for the elderly is a follow-on to the K3300 for kids. Like most cell phones for seniors, the S-series model emphasizes simplicity. It allows for speed-dialing, including preprogrammed emergency numbers, and provides one-way communication for remote monitoring. For the Korean market, LG Electronics has the NS1000, a lightweight cell phone targeting the elderly. It makes regular phone calls, sends text messages and has extra-large keys. This cell phone is not to be confused with another product with a similar name - that would be the NS1000 Back To Basics Nutri Source Juicer. Austria-based Emporia Telecom is taking the complexity out of mobile phones for seniors with its EmporiaLife product. It emphasizes big buttons, large screen with large type and a simple menu for the hearing-aid compatible phone. Two noteworthy EmporiaLife features - the ability to manage the device's phonebook via SMS text messaging and the automatic switch to voice command mode once a phone connection is made. Expanding well beyond its Austrian and German market base, this simple phone has surfaced in the U.S. as the ClarityLife C900 Amplified Mobile Phone. In Australia, Benefon's Seraph is a three-button phone for direct-dialing predefined numbers. Telemedicine company Vitaphone and Mobi-Click AG in Germany, offer a three-button phone called SeniorTel III.